Growing tomatoes from seed indoors rather than sowing directly into the garden has real advantages--even if you live in a region with a long growing season and plenty of warmth! That's because you can better control the growing conditions: the soil, the lighting, and the containers. Best of all, you have a much greater choice of varieties and have complete control over all the tomato plant growing stages. It isn't complicated, and saves you money besides. Although tomato seeds can be started in just about any soil, I recommend you don't use regular soil from your garden. You'll minimize the chance of losing your seedlings to disease if you use sterile soil when growing tomatoes from seed. You can start seeds in any container as long as it has drainage. The containers, whether bottoms of waxed milk cartons, paper cups, seed flats or individual containers, should be about two to three inches deep. 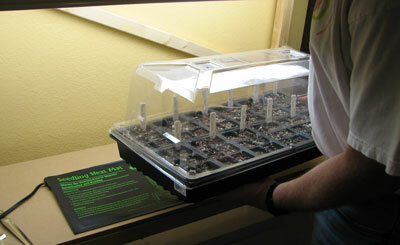 I prefer to use seed trays, which are plastic trays molded into individual cells--one per seedling after thinning. 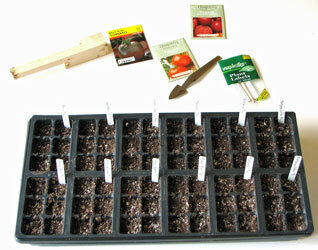 For best results follow the steps in the article Starting Seeds Indoors. About a week after the seeds have germinated and the second set of leaves has formed, which are the first true tomato leaves, it's time to thin the tomato seedlings. By this time the seedlings are one to one and a half inches tall and the cells are becoming crowded. Examine each cell and carefully extract the stragglers, the weaklings, and the leggy ones. Leave the sturdiest, best-looking plants. It's no time for mercy--if you're ruthless about eliminating the weaklings you'll end up with stronger, healthier plants. One way to thin the plants is to use scissors and snip off the weaker ones at soil level. Another way is to pull the weaklings out. If you want to save some of the seedlings they should be transplanted to their own containers. Once the tomato seeds have germinated, adequate light becomes essential. Ideally they need 12 hours of sunlight per day. Set them in a warm southern-facing window if you can. All things being equal, a humid bathroom works best. If a sunny window for the seed flats is not available, you can use artificial lighting. If natural light is not an option, there are many types of grow lights available on the market; you can spend as little as ten dollars or hundreds. Simple 48-inch shop lights fitted with standard or high output cool white bulbs work very well for growing tomatoes from seed to the point where they're ready for transplanting to the garden. If you're planning to grow tomatoes indoors to maturity you'll probably want to invest in quality full-spectrum grow lights. Fluorescent lights work best if suspended two or three inches above the tops of the plants; hang the lights by a chain on a hook so that the height can be adjusted easily. You don't have to spend a lot of money; I was able to build a cheap grow light stand for very little. The best lighting is directly under the center so it's a good idea to occasionally rotate the containers. Because the lights are cool there is no harm done if the leaves touch the bulbs. 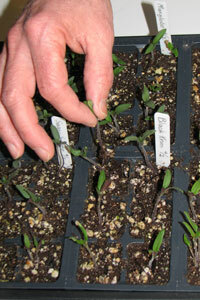 Brush the tops of the seedlings lightly using your hand each day. This helps harden the plant stems and causes them to grow stockier. This is called mechanical conditioning--it reduces leggy seedlings and results in more compact plants. If you've used a pre-fertilized soil mix, you shouldn't need to fertilize the seedlings, but if some of the leaves are yellowing, apply a liquid tomato fertilizer at half strength. If you haven't used a pre-fertilized mix, then a weekly application of fertilizer low in nitrogen but high in potash and phosphorous should give good results. After just a few days under the light, the young tomato plants will be four inches tall, have outgrown their cells and be ready to be transplanted to small pots. Some experienced gardeners believe their tomatoes thrive when transplanted to successively larger containers. It may be because of the fresh nutrients in the soil mix along with the added room for root growth. The steps are covered in the article on transplanting seedlings. If the plants appear to be getting too leggy, pinch back the tops. This will force the plants to grow stockier and sturdier, and also results in more blooms per plant. When the average frost free date has arrived, and the soil temperature has reached 50 degrees F it's time to move your tomato plants outdoors. One week before, it's a good idea to "harden off" the young tomato plants by placing them in a protected spot like a cold frame. A wheelbarrow or toy wagon can also be used to move the young plants outside during the day and into the garage at night. This process will ideally firm up the plant tissues to withstand unpredictable and unfavorable weather conditions. Now that you have made a great start on growing tomatoes from seed into healthy young plants, it's time for planting tomatoes into the garden or outdoor container!